Use of operational criteria for the specification of the units of linguistics description. underlying (deep) syntactic layer, called tectogrammatical layer. As the lower layers of the language description (esp. phonetic and phonological) have been thoroughly studied and described by classical authors of the Prague School of Linguistics, FGD focuses on the higher layers of the language description, from the morphemic one through the surface syntax to its primary goal – the tectogrammatical layer. On the three lower layers, the sentence is described in a form of a string, whereas on the two syntactic layers, it is represented as a dependency tree, with the verb as the root of the tree. The theoretical framework of FGD serves as a basis for the Prague Dependency Treebank (Hajič et al., 2006, Bejček et al., 2013) and its successors as esp. Prague Czech-English Dependency Treebank (Hajič et al, 2011). The primary focus of FGD is the tectogrammatical (underlying syntactic) layer (esp. Sgall et al., 1986, Hajičová, 2006, Panevová et al., 2014). The tectogrammatical representation describes the meaning of the sentence, thus synonymous sentences have a single representation on this level, while an ambiguous sentence has more than one tectogrammatical representation. The tectogrammatical layer contains complete information on the sentence required for its transduction on the lower layers. 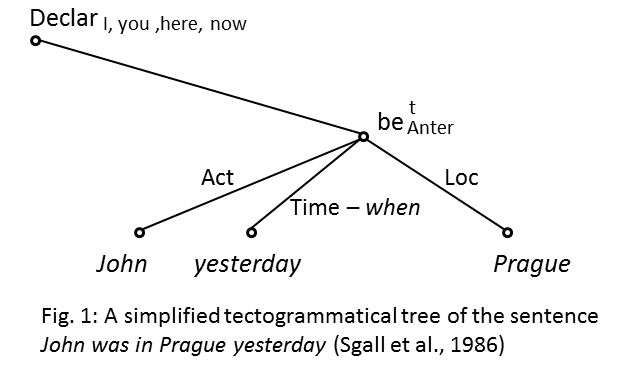 The tectogrammatical representation is described in a form of a dependency tree, where individual nodes represent the meaning units of the sentence (containing their lexical and (deep) morphological information) and edges stand for (deep) syntactic relations between the relevant nodes (Petkevič, 1995, Sgall et al., 1986). In addition to the “vertical dimension” of the dependency tree, which captures the relations between a head (governor) and its modifiers (dependents), the “horizontal dimension” – i.e., the order of the nodes from left to right – represents the deep word order which accounts for the information structure of the sentence, i.e., its topic-focus articulation (TFA).